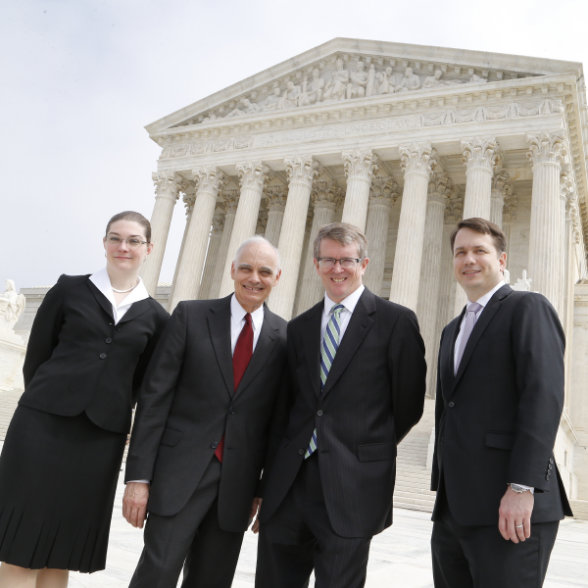 Left to right, Emma Baratta, Jim Dabney, John Duffy, and Richard Koehl, outside of the U.S. Supreme Court. May 22, 2017 – Hughes Hubbard scored a decisive victory for TC Heartland LLC in the Supreme Court of the United States. The Court’s 8-0 decision restores patent venue protections which U.S. businesses had enjoyed for nearly a century between 1897 and 1990. The patent venue statute, 28 U.S.C. § 1400(b) provides that patent infringement actions “may be brought in the judicial district where the defendant resides . . . .” The statute governing “[v]enue generally,” 28 U.S.C. § 1391, has long contained a subsection (c) that, where applicable, deems a corporate entity to reside in multiple judicial districts. In Fourco Glass Co. v. Transmirra Products Corp., 353 U.S. 222 (1957), the Supreme Court held that § 1400(b) is not to be supplemented by § 1391(c), and that as applied to corporate entities, the phrase “where the defendant resides” in § 1400(b) “mean[s] the state of incorporation only.” Id. at 226. That interpretation of § 1400(b) stood for more than 30 years until the Federal Circuit, in VE Holding Corp. v. Johnson Gas Appliance Co., 917 F.2d 1574 (Fed. Cir. 1990), held that a 1988 amendment of 28 U.S.C. § 1391(c) had greatly broadened the meaning of the word “resides” in § 1400(b). On May 22, the Supreme Court overruled the VE Holding decision and held that as applied to corporate defendants, the § 1400(b) phrase, “the judicial district where the defendant resides,” refers only to a district located in a defendant’s state of incorporation. Under TC Heartland, a U.S. corporate defendant cannot rightly be sued for alleged patent infringement except in (i) the judicial district where the defendant’s legal domicile is located, (ii) a judicial district where the defendant has both committed acts of infringement and maintains a regular and established place of business; or (iii) a judicial district where a defendant has waived any objection to patent venue. HHR took the case to the Supreme Court after lower courts refused to transfer a patent infringement law suit brought by Kraft Foods Group Brands in Delaware federal court to Indiana, where TC Heartland is incorporated and based. The sweetener manufacturer drew overwhelming amicus curiae support from a diverse coalition of corporate amici, public interest law groups, trade associations, law professors, and a retired Federal Circuit chief judge. The ruling made headlines around the nation, including The New York Times, The Wall Street Journal, Bloomberg, Reuters and The National Law Journal. Law360 selected the team as "Legal Lions." The HHR team, led by Jim Dabney, also includes John Duffy, Richard Koehl, Jim Klaiber, Ross Lipman, Tina Schaefer, Emma Baratta, David Lansky, Lynn Russo, Stefanie Lopatkin, Michael Polka, Matt Voas and paralegal Jeff Bednar. The Opinion of the Court is available here. The Wall Street Journal article, "Ruling Curbs Patent Suits," is available here. The Wall Street Journal's Review & Outlook also covered the case. "Supreme Court Patent Victory" can be read here.